Remodel • Pioneer Courthouse is one of only seven original public buildings in city. But that's not to say the county never had a hanging. Douglas Alder, a past president of the Washington County Historical Society and Dixie State College, said that in about 1875, a miner working north of St. George in Silver Reef was accused of killing a fellow miner. The alleged killer was arrested and jailed in the basement of the courthouse. But he wasn't there long. Shortly after he was put in the jail, a group of the murder victim's friends descended on the courthouse, broke out the prisoner and hung him from a nearby tree. That's just one story attached to the historic structure that St. George plans to restore. The city recently approved slightly more than $500,000 to begin renovating the building's exterior. Alder applauds the city's commitment. "It's one of the seven original [public] buildings in St. George," he said. 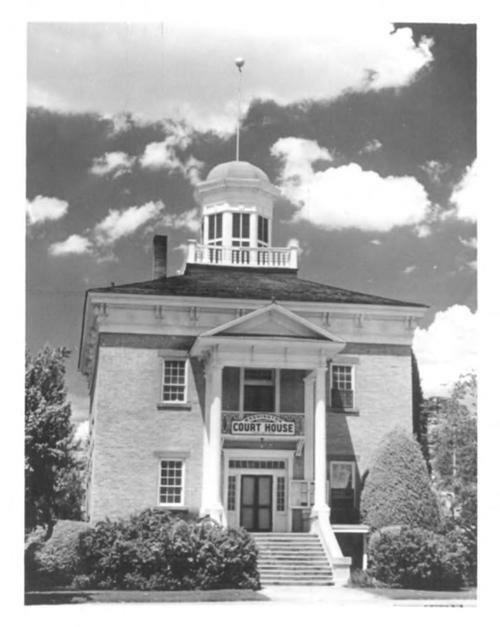 Work on the courthouse began three years after St. George became the Washington County seat in 1863. The two-story building, built of sandstone and baked brick on a lava foundation, is located at 97 E. St. George Blvd. It has interior walls that are 18 inches thick, and original paintings of Zion Canyon and Grand Canyon still grace its upstairs walls. "We always find them guilty," said Alder. St. George Mayor Daniel McArthur said the city acquired the structure, adding to the National Register of Historic Places in 1970, from the county in the 1980s in a land swap. He said the building's roof and exterior walls need repairs. Drainage problems will also be addressed. In early Feburary, the City Council appropriated $500,000 for exterior work on the recommendation of the city's Historic Preservation Committee. "It's a bit more than we wanted, but worth it," he said of the cost. "It's a beautiful building that should be kept as a treasure of the past." He said the interior will be restored during a second phase of the project in the future. Miles Romney, who built the St. George LDS temple and tabernacle, also built the courthouse. It cost $10,000, which was raised by a tax hike approved by voters. 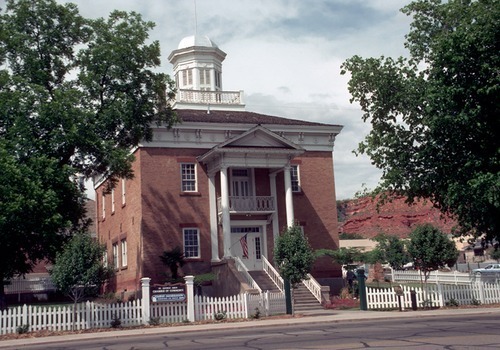 Richard Kohler, president of the Washington County Historical Society, said Romney, the great-great-grandfather of GOP presidential candidate Mitt Romney, probably built the courthouse based on a design by William H. Folsom, who was then the architect for the Mormon Church. Kohler said the courthouse is strikingly similar to the Council Hall building just south of the state Capitol in Salt Lake City, which also is based on a Folsom design. Kohler and others believe Council Hall may have been copied for the courthouse, including its cupola. When buildings were constructed in the mid-19th century, he said, builders usually had just a picture to work from, not the detailed drawings architects produce today. "He [Romney] probably just had a picture of the front and a drawing of a floor plan," he said. He doubts the cupola was built with the express purpose of hanging criminals. "I don't know if there's ever been a [legal] hanging in the county," he said. Still, McArthur said many still believe the cupola was indeed built for that purpose. "My dad told me it was built for hangings, but none ever happened," he said. "I've always pictured it as a gallows with trap doors and everything."